Here you will find the new mixers and showers of the premium brand hansgrohe. We have developed them with our passion for water and German engineering flair. Check out Select, the innovative hansgrohe technology with a simple button. A joy to use at the touch of a button: in the shower, at the wash basin, or sink. Hansgrohe's new masters of the kitchen are attractive, versatile helpers - they come equipped with hand sprays, various jet types or swivel functions. Top news for kitchens: convenient water control at the touch of a button. The "Select" button makes work at the sink even easier. Hansgrohe is creating more space in the bathroom and expanding the ComfortZone: with refreshingly convenient wash basin mixers from the new Metris, Talis and Focus lines. Digital tools help you find your way around. Gentle rain or refreshing waterfall? Control your shower experience at the touch of a button. Choose between different jet types and immerse yourself in a whole new showering dimension! You will love the clear-cut, modern design of this new XXL overhead shower. Water on, water off at the touch of a button! This innovative product offers even greater convenience at the wash basin. 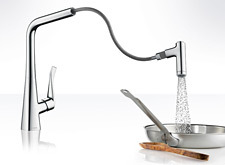 No levers are required for this new generation of hansgrohe mixers featuring Select technology. State-of-the-art form and function unite as one. 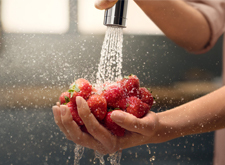 When it comes to daily kitchen chores go with the flow. Design gourmets will find it especially ergonomic to stop and start the water flow with the new Metris Select and Talis Select mixers. The sink becomes a ComfortZone – cooking, filling, and cleaning are no longer a chore, but a pleasure. Kinderleicht auf gute Laune umschalten. Seinen Brausenklassiker Croma hat hansgrohe jetzt mit cleverer Select-Technologie ausgestattet. Damit die ganze Familie so vielseitig wie möglich duschen kann. Ganz einfach auf Knopfdruck. Und das Design der neuen Duschköpfe? Wird auch allen Spaß machen! 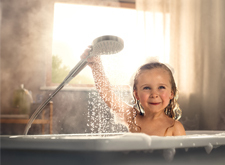 Extra support and stability for the whole family: with Unica Comfort, everyone feels safe in the shower and bath tub. Showerpipes that are as varied as the people taking the showers. The summer rain forms plump droplets of water as it rolls out of the overhead shower and on the hand shower you can easily select your favouriate jet type at the touch of a button. The innovative Ecostat Select thermostat shelf area also offers ample space for your shower utensils. Pre-assembled shower systems guarantee even more showering fun and freedom of movement in the bathroom. Enjoy the wide range of forms, heights and jet types. RainBrain is the name of our control centre in the shower. 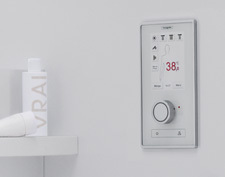 It controls shower operation, jet types, temperature and music at the touch of a button. The only thing left for you to do by yourself is sing. 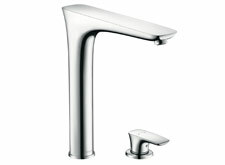 Hansgrohe is expanding the PuraVida range: with mixers for the wash basin, the bath tub and the kitchen sink. This means: everyone can find an individual solution and just the right mixer for any ceramics. Hansgrohe is bringing three new high quality kitchen models to the market: these beautiful mixers from PuraVida can be installed wherever you wish in your modern kitchen. And the high-quality design of Focus E², with its attractive price, cannot fail to impress. 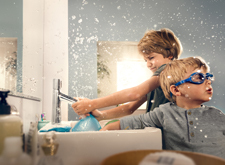 What makes hansgrohe Select so enjoyable to use? You can control mixers, showers and jet types quickly, intuitively and conveniently. People of all ages will enjoy the easy-to-use click button. The ergonomic operation is ideal for people with physical disabilities. 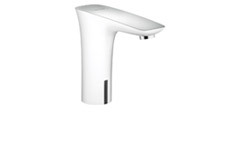 The Select button or handle is purely mechanical, so no additional electricity consumption. Both are robust and have been thoroughly put to their paces in stress tests. So you will be able to enjoy them for many years to come. Our selection of products contains everything you could possibly need: hansgrohe offers a versatile range for both bathrooms and kitchens to go with any style.